Davidson Seamount, a huge underwater volcano, is located just outside the boundary of the Monterey Bay National Marine Sanctuary. (Image courtesy of MBARI) Click image for larger view. This spring, scientists explored the first undersea island to be called a seamount. Davidson seamount, located 120 km Southwest of Monterey, California, is one of the largest known seamounts in U.S. waters. Although these geological features have been known about for quite some time, only recent technological advances allow for comprehensive studies. 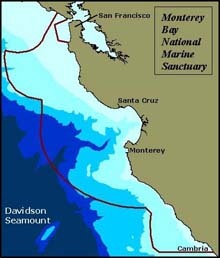 The exploration team was led by scientists from the Monterey Bay National Marine Sanctuary . Collaborators included the Monterey Bay Aquarium Research Institute (MBARI) , the Moss Landing Marine Laboratories , and the Monterey Bay Aquarium . Background information for this exploration can be found on the left side of the page. Daily updates are included below. More detailed logs and summaries of exploration activities can be found on the right. May 23 Davidson Seamount is geologically similar to other seamounts in the region; however, there are important differences between it and other undersea volcanoes. Learn more about the seamount's complex geology in today's log. May 22 The explorers are also interested in the animals that live near the surface in the waters over the Davidson Seamount. Scott Benson discusses what the scientists hope to learn about coastal California's sperm whale population. Follow sperm whales with the science team. (QuickTime, 1Mb). May 21 What do the animals of Davidson Seamount look like? Read Mario Tamburri's mission log describing the expedition goals. Watch a video clip of the amazing creatures that inhabit this submerged volcano (QuickTime, 830k). May 20 In order to collect deep-sea animals and keep them alive, the Davidson team must recreate a deep-sea environment onboard. Read how they do this in a report by Edward Seidel. Watch a video of the ROV collecting samples (QuickTime, 1.1 Mb). May 19 On Sunday, the Davidson team made a long transect from the base of the seamount to the crest on the northwest flank. Bill Douros, Superintendent of the Monterey Bay sanctuary, records the first log. Read his report and observe some of the animals they saw. May 17 Listen to the Davidson team share their excitement about the mission in a short briefing. The video was recorded as they steamed to their destination far off-shore (QuickTime, 1Mb).